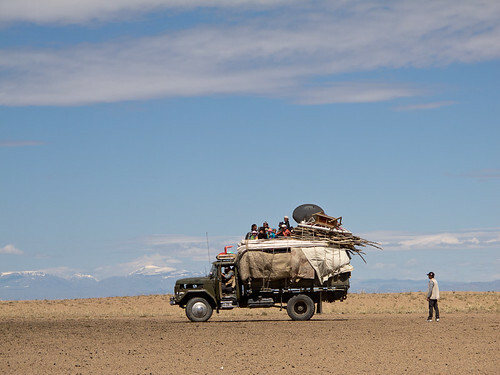 Crossing the border from Russia to Mongolia with our bicycles strapped to the top of a bouncing taxi we had our first glimpse of the unpaved Mongolian roads which we would soon be riding on. After a week of living in a Ger while we awaited delivery of replacement rims we were more than ready to return to the open road again. Our first few days of cycling in Mongolia saw us getting used to the road conditions and the difficulties of riding a fully loaded touring bike on sand, gravel and loose rocks. We took an afternoon off from cycling to watch the Naadam horse racing before we pushed onto some hot and thirsty cycling through the desert stretch of our route. We passed the 14,000 kilometre mark along the shores of Telmen Nuur and recorded a day of eating Mongolian food before our bicycle wheels hit tarmac and we found ourselve back on the tourist trail. Our final few days cycling towards Ulaanbaatar saw us take in some of our first sight-seeing in Mongolia before a difficult and muddy entrance into the city proper. We spend a week in Ulaanbaatar sorting out visas, luggage and enjoying Korean, Thai and Indian food. Thanks to Krystil and Chris who documented their cycle tour of Mongolia in 2009 on their blog. Chris was also kind enough to give us a copy of their GPS route saving us a heap of naviagtional headaches. This map shows the route we cycled through Mongolia. To see full details of where we have cycled, take a look at our full route map.